Phoenix-based O-SO PURE offers a total water sterilization system, which provides up to 13 gpm of filtered and sterilized water for an entire medical building or dental practice. 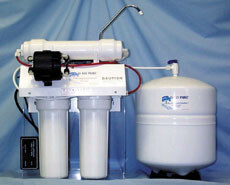 The DWSEF3 utilizes a new technology proven to filter high volumes of water down to half a micron without premature filter clogging. Under normal conditions, all water is first filtered by a 10 micron carbon block. Water is then filtered a second time, by a half micron carbon block filter, which is capable of parasite removal (Cryptosporidium and Giardia).